Hometown investors, the local group of angels and VCs within a startup community, are an essential part of startup ecosystems. They can be great connectors, providers of advice and most importantly, suppliers of the venture capital to enable startups to grow. I was curious if hometown investment patterns differ across the 10 major cities in the US. 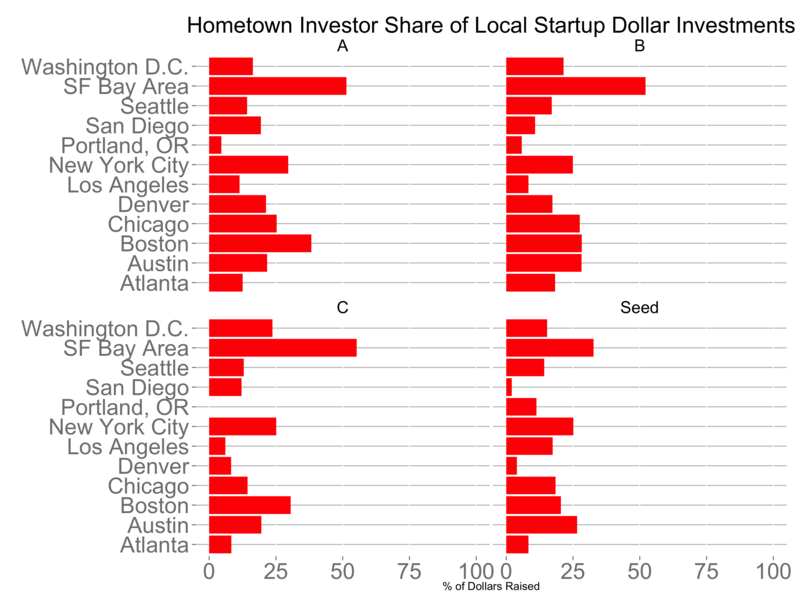 I’m defining hometown investment is the share of dollars raised by a startup contributed by investors based in the startup’s hometown. For example, a NYC startup that raises a $1.5M seed from New York investors and then a $5M A from Boston investors would have a 23% hometown investor share. Using Crunchbase data, I calculated the hometown share in the 10 major startup cities in the US over the past 4 years. The chart above shows the fraction of hometown dollars by city and by fundraising stage for Series A, B, C and Seed. I had to make some assumptions about the data, particularly in the case of multi-investor rounds because of the granularity of the Crunchbase data, so there is some error rate I can’t control for in the data. But the data is interesting despite the higher error rate. Not surprisingly, San Francisco Bay Area which is the largest startup market has the highest hometown investment share at greater than 50%. In other words, 50 cents of every dollar raised by San Francisco-based startups is invested by San Francisco investors. In the second tier of hometown investor cities, 24 cents of every dollar are hometown dollars and for the third tier, it’s 11 cents. It’s important to note that the discrepancy in hometown investor share increases as a company raises later rounds. In the seed stage, hometown investors exhibit similar investment rates, somewhere between 15-25%. But as the round size increases, even at the A, institutional VCs with larger fund sizes skew the data to the Tier 1 and Tier 2 cities. Though we don’t have direct knowledge of the fundraising processes of each of these companies, which makes it impossible to compare the length and difficulty of each process, it’s fair to presume companies based in the Bay Area travel less to raise their rounds compared to other founders in other cities. Nevertheless, at the outset, it’s the hometown investors in each of these cities that provides the capital to get startups off the ground and they seem to be contributing equally across most of the major startup cities in the US.